While flying overhead, a luxury boat anchors in a protected bay on Lake Superior near Thunder Bay, Ontario in Canada. A tranquil and calm bay along the shores of one of the islands is where a luxury boat decided to anchor for a short time to enjoy the serenity of Lake Superior. A small beach runs the coastline of this island where passengers aboard this boat could disembark and go ashore to explore. 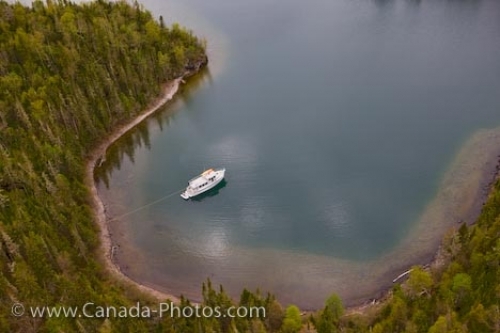 Aerial photo of a luxury boat in a small protected bay on Lake Superior near Thunder Bay, Ontario in Canada. Luxury boat anchored in a small protected bay of an island in Lake Superior near Thunder Bay, Ontario, Canada.